The approach of spring is an excellent time to think of gardening. One of the projects on my bucket list is to create a beautiful flower garden in my “sacred space” near the statue of Our Lady in the forest adjoining our home. As my children were growing, then as I began writing fiction, this project has been pushed down on my priority list time and again. Realy’s book has given me a renewed enthusiasm to set aside time this spring to begin to work on my sacred space. 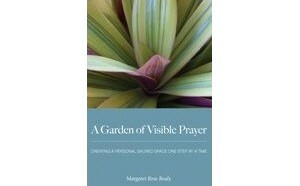 “A Garden of Visible Prayer” begins with a beautiful St. Teresa of Avila quote, “A beginner must think of herself as one setting out to make a garden in which her Beloved Lord is to take His delight.” Wow.